heads up ... the premiere of The Grand Tour, Amazon prime's remake of Top Gear, which was actually supposed to air tomorrow is available tonight via on-demand viewing. So far, it's great! The boys are back! The first episode was great! I can't wait for next Friday... or really Thursday if they keep up the midnight GMT Friday release (6:00 PM Thursday for me in Central time zone). For a 1st episode, it was very good. They seem to have a large budget....enough, I read, to smash up Priuses. The bias against the Prius is something I see and don't understand. It's a great car for most ppl. shay2nak and surferpkt like this. Since my prime doesn't run out till the 21st I should be able to see it. I will give it a shot when I get home tonight. Alright, this is a tight-knit community - someone has to know who had the Elise during the desert scene at "Burning Van"!! Aside from a lot of it just being his persona, there is a very strong argument against battery powered vehicles saving the environment because of the extremely nasty processes involved in mining, purifying, and recycling the various metals and chemicals in batteries. Add that to the fact that, as Jay Leno put it, people often care more about looking like they are saving the planet than the actual result, and you get a pretty big target to aim at. Take a look at all the celebrity "environmentalists" who fly in private jets to go speak about global warming. Well, in reality, my friend, that is incorrect. You are thinking of false rumors spread by GM when the Prius arrived. Brock Yates was part of that bs. They didn't want anyone to know that the batteries are about 98% recyclable. And, they often last >200k miles. Rebekka has 240k on her Prius and on orig battery. Note: Even with about 1000 patents, the Prius is the most reliable car sold here. Toyota was quite mindful of the environment when designing this stuff. They could have got more power, but that would've made the battery less recyclable. 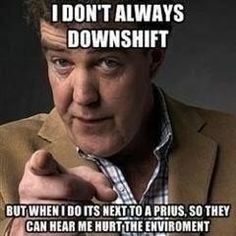 I imagine I know more Prius owners than most ppl. None have taken the pious approach or attitude. They love their cars and its reliability and mileage. They like polluting less, but none think they are personally saving the planet. Leno is a good guy, but not someone I'd look to for an unbiased view here. My best friend was the Toyota engineer in charge of introducing the Prius to America. Because he was so smart (unlike me), I know a lot of stuff. Did anyone know the Prius can steer you out of a skid even you do it all wrong?? I answered your question perfectly correctly. Remember - you're question was why he had such an agenda. I never stated or implied those are my views or even if they are correct; they are simply the answer to the question you posed. My brother drives a Prius C due to my recommendation, but I drive a light, efficient gas car because both were the best solutions to our given problems. ... there is a very strong argument against battery powered vehicles saving the environment because of the extremely nasty processes involved in mining, purifying, and recycling the various metals and chemicals in batteries. Add that to the fact that, as Jay Leno put it, people often care more about looking like they are saving the planet than the actual result, and you get a pretty big target to aim at. Take a look at all the celebrity "environmentalists" who fly in private jets to go speak about global warming. Sorry, but the first quote led me to think you believed such things. Just watched it. Not bad. Could use a better intro song... Bright sunshiney day? Really? I thought it was pretty good, I did enjoy it but I am not sure if I enjoyed it enough to become an Amazon Prime member. Wasn't bad, it has potential. I just wish they hadn't rigged the drag race so that each of the three cars would win. I like the point they made though; 0-60 times have gotten so astonishingly fast that reaction time is a bigger variable than the cars. It made think of the typical bar argument "well, the xxxx is 0.3s fast to 60 so it is way better" when in reality it is just as fast something a second slower in many scenarios. The launch control on modern cars is crazy optimized in order to get a sub-3s time, so giving the Mac different tires was a huge handicap, too. Its launch control just wasn't tuned for them. Same reason why it was the fastest around the track when on its OE tires but not when it was on the same tires as the others. My wife is a chemist. She has told me that the batteries are bad for the environment when you create them. She also mentioned that they are hard to recycle. But details lacking, I could be wrong. The 98% sounds suspicious to me. Perhaps that is some theoretical percentage not really achieved by the companies that actually recycle them? Again I could be wrong. I liked it a lot but I was a huge fan of Top Gear UK. It was well done, and clearly very high budget, but seemed pretty stale and meticulously scripted. I'm hopeful for the more shenanigans-filled episodes. Making a battery is bad for the Environment?. Compare that to extracting Oil from the ground. I won't even mention the Canada to USA pipeline. All relative I guess.